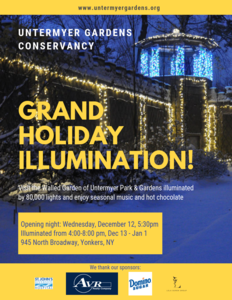 The Untermyer Gardens Conservancy, a non-profit organization working in partnership with the City of Yonkers, announces the Opening Ceremony for its third annual Grand Holiday Illumination at the Walled Garden. The event is free and open to the public on Wednesday, December 12 at 5:30 PM. The Walled Garden will be brilliantly illuminated with festive holiday lights, highlighting the rich architectural and horticultural elements of the garden. Beautiful seasonal music in the Jewish, Christian, Muslim and Zoroastrian traditions will be played. The Illumination will take place every night from December 13 - January 1 from 4:00 until 8:00 PM. Hot chocolate will be served by various community groups on most evenings. On December 12, the Illumination will be opened with the sequential lighting of various sections of the Walled Garden. We hope you will join us in celebrating the holiday season.